Quotes I love: "A girl should be two things: classy and fabulous." Leave it to Coco Chanel to say something so inspiring and true - women of all ages try to achieve classy and fabulous looks! Unfortunately though, it's not as easy as it sounds. You need to appear polished, well mannered, fashionable, and not too over the top! Here's my take on how to appear classy and fabulous. Have proper etiquette: How classy you look will always be based on how you present yourself. Whether you're at a dinner party, the mall, or even a bar, your posture, manners, and language all reflect your level of class. It doesn't matter if you're wearing a Zuhair Murad dress, if you're slouched, drunk, and throwing around the F-bomb, you wont look classy. Remember to be respectable and tasteful. Be knowledgeable: Being aware of politics, current events, or at least knowing the facts about the country you live in is all respectable. It shows that you have a career and are educated which is, undoubtedly, very classy. Dress the part: You need to appear put together and well polished if you want to look classy and fabulous. If you look vulgar or wear ripped or stained clothing, you wont look classy. On the other hand, if you wear plain business suits everyday, you wont look fabulous! Make sure to find a balance and look fashionable, respectable, and elegant. For this ensemble, I started with an elegant, powder-blue dress - it has just the right amount of modern elegance and class. 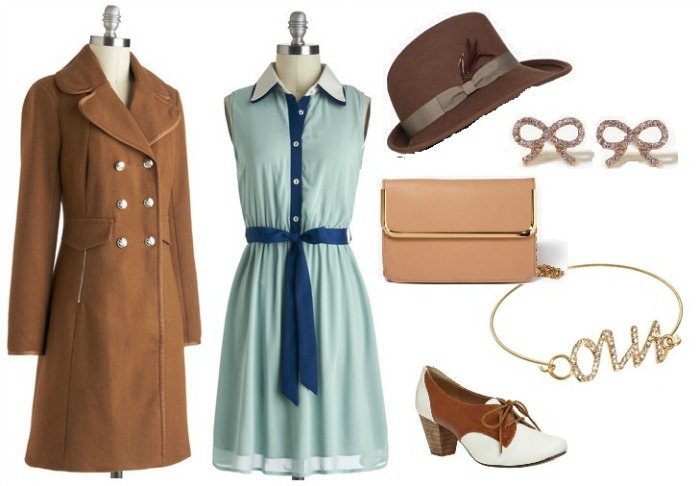 I then added shoes that complimented the color-blocked dress and a classic brown coat. I then accessorized with a bowed hat. the 'oui' bracelet represents a bit of Coco's French background and the bow earrings compliment the other bows in this outfit (blue sash, and hat). To complete the look, I chose a simple, feminine clutch. For this formal ensemble, I started with a simple, strapless black dress and accessorized with a leather bow belt. Next, I added a stunning purse and long, intricate earrings to add some sparkle to the outfit. I then chose classic, pearl bangles, and a pair of exquisite heels. Finally, I finished the look with an elegant coat. What do you think about appearing classy and/or fabulous? Do you think it’s essential? Do you think the outfits are classy and/or fabulous? Are there any other fashion quotes you would like to see in this series? Couldn't agree more with your tip! And that date night coat is absolutely gorgeous!!! You have such a great classic style - I'll be following on gfc to see more!! Thanks so much for stopping by and for your comment! awww, didn't realize you don't have gfc...but I'll make sure I check back to see what else you have in store! Yeah I don't have it :( But thanks so much, Tiff! These are great tips! And I couldn't agree more...always dress the part. The idea of this entire post is fabulous. It truly is ingenious. And all of it is such gorgeous inspo. i am quite a fan of street chic much more than being "classy", classist connotations and all you know..but i love the suggested things here when you are to be in character you have to be full on prepared.and knowledge is the key! Her quote nailed it - so true, and we don't see enough of it from our younger generation! I totally agree with you! I try to be classy and not overdress; be polite with everybody... this is one of the most important things. I loved this post! And I really like your blog :) I'm following you now; follow me back? & great looks, the first is my favourite! I agree with the fact a girl should be classy and fabulous. We must. Haha. One of my favorite quotes! I love that coat in the last set, it's SO pretty! Love this post! Such great information! I really liked this post! The outfit inspiration is lovely, you picked some great pieces and I think I could wear each one of the outfits here. Your tips are also so right on! Too many people seem to think that clothes make the (wo)man while it's the other way around. Good manners can get you far even if your clothes' price tags didn't have three zeros on them. Fun post! Loving your outfits! My fave is the 2nd one! good advice and excellent post.